We would like to thank Looney Labs for the review copy of Firefly Fluxx used for this review. Other than receiving the review copy we at Geeky Hobbies received no other compensation. Receiving the review copy had no impact on the content of this review or the final score. Like the main Fluxx game, Firefly Fluxx is a game that starts out simple but can quickly become full of crazy and constantly shifting rules. At first, all players do is draw a card and play a card. However, many of the cards in the deck are “new rule” cards which alter the rules in occasionally crazy ways. The object of the game is to satisfy the conditions of the current “goal” card (usually having two specific “keeper” cards in front of you), even if it isn’t currently your turn. As usual, Firefly Fluxx begins with set up. Simply place the “basic rules” card in the center of the table, shuffle the deck of cards, deal three cards to each player, and place the remaining cards face down next to the basic rules to form a draw pile. That’s it, set up is complete. According to the rules, the first player to play is “whoever takes initiative to get the game going” by drawing the first card. The basics of each turn are the same (draw a certain amount of cards and play a certain amount of cards) but the rules change how many cards you can draw, play, and keep (and some give players other bonus actions that they can take as well). At the start of Firefly Fluxx, the only rules are the two on the “basic rules” card (which lets the player draw one card and play one card from their hand each turn). The player who took initiative to go first does this and then passes to the next player clockwise (play always moves clockwise until someone has completed the requirements of the current goal card and wins). There are six different types of cards that can be drawn and played in Firefly Fluxx. First up are new rule cards. These can alter how many cards can be drawn or played in a turn, put limits on how many cards you can have in your hand or keepers you can have in front of you at a time, or add new free actions to the game (for example “Plunder!” lets players steal any keeper that an opponent has played to the table once during their turn, “Let’s Keep Doing That!” allows them to take an action out of the discard pile and use it once during their turn as a free action before the card is discarded again, and “Recycling” gives them the option of discarding one of their keeper cards from the table to draw three extra cards). As you can see, Firefly Fluxx starts very simply with just these two basic rules. It will quickly grow more complex however. If a new rule card is played that contradicts one already in play (for example the “Play 3” card is played when there is already a “Play All” card on the table), discard the old rule and replace it with the new one. New rule cards take effect immediately so if you upped the amount of cards you can draw in a turn, you get to draw the extra cards immediately instead of waiting for your next turn (and if you played a hand limit card, ALL players must discard down to that amount right away if necessary). Some of the new rule cards can be pretty crazy, for example the “Play All” card forces you to play all of your cards (any cards already in your hand and the ones that you draw), even if you don’t want to (there are even some situations where you could end up giving your opponent the win by being forced to play a card). This is an example of how the rules can quickly evolve in Firefly Fluxx. In this example, players will draw four cards each turn, play two, keep their hands down to three cards (meaning they will most likely have to discard cards each turn), and they get a free action where they can take the top card from the draw pile and play it immediately (in addition to the two cards they will play in a normal turn). 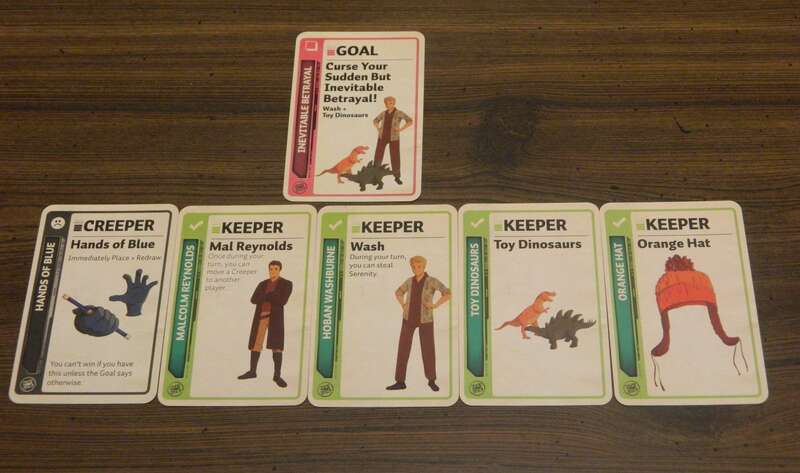 The current goal is to own both the Wash and toy dinosaur keeper cards. Next up are goal cards. Goal cards are similar to new rule cards in that they apply to everyone and playing a new one discards the previous one. Goal cards also change the rules but only effect the win requirements. In most cases, they require a player to have two specific keeper cards in front of them to win. However, there are some that you only have to have two out of three items listed (for example “Personal Effects” requires any two of “Orange Hat,” “Toy Dinosaurs,” or “Swirly Parasol” but not the third) and there are two cards that actually require you to have a “creeper” card (which are usually bad since having them in front of you usually blocks you from winning) in front of you. The third card type in Firefly Fluxx are “keeper” cards. To play a keeper card, take it out of your hand and place it on the table in front of you. Playing keeper cards is always a good thing but there are a lot of cards that allow them to be stolen, so be cautious with which ones you play in front of you. The main purpose of keeper cards is to satisfy the goal requirements but some cards also allow you to perform special actions for as long as you have them (for example, Zoe Washburne lets you steal Wash and the “Guns” card protects you from being plundered). Firefly Fluxx also has “action” cards which let the person who played it perform an action (it doesn’t become a new rule that everybody follows like new rule cards though). They are used once (do exactly what they say) and then are discarded. Some action cards are relatively simple while others can cause complete chaos. Action cards can sometimes cause additional cards to be played but everything that happens as a result of an action card is considered to be just one action. Some sample action cards include: “Draw 2 and Use ‘Em” (which lets you draw two cards and play them immediately in any order you wish), “Rules Reset” (which discards all new rule cards except for the basic rules card), “Press Your Luck” (which allows the player to draw from the draw pile one at a time until they either decide to stop and take all cards drawn or they draw a keeper or creeper card which ends the action and the player will have to discard all cards drawn during this action except for the keeper or creeper), and “I’ll Be In My Bunk” (which lets the player leave the room for a few minutes and while they are away they remain eligible for victory and no players can “mess with their stuff,” their turn(s) are skipped until they return but they get an extra card when they return). 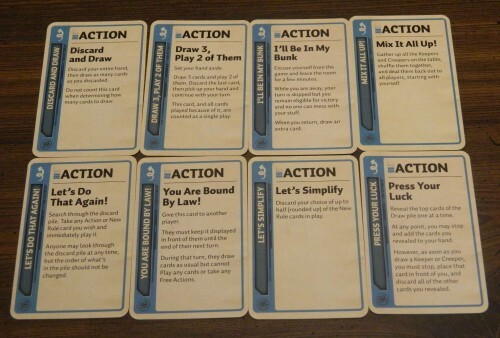 A look at some of the possible action cards you can draw in Firefly Fluxx. “Surprise” cards are similar to action cards but they can be played at any time, even during an opponent’s turn. Surprises have two different functions that players can chose from, one for during their own turn (usually much weaker) and one for playing it out of turn. For example, “You Can’t Take This Guy From Me” can be used out of turn to prevent a player from taking one of your character keepers and instead you get their entire hand of cards (if you play it during your turn, you just get to use the power of any keeper on the table as if it was yours). All surprise cards can also be used to cancel other surprises used by other players (so you could cancel the loss of your entire hand of cards from “You Can’t Take This Guy From Me” by playing any other surprise card to cancel it out). Finally, the last card type in Firefly Fluxx is the “creeper,” which are usually negative since you normally can’t win with one of them in front of you. There are only two of these cards in the deck (“Hands of Blue” and “Reavers”). Whenever these cards are drawn, they are immediately placed on the table in front of the player that drew it. That player gets to draw another card to replace it and playing the creeper card does not count as a “play” (or action). Players who have creeper cards in front of them cannot win, even if they have fulfilled the requirements of the current goal (unless that goal just happens to require one of the two creepers as part of its win condition). They must first get rid of any creeper cards in front of them before they can win. To complete their turn, a player must draw and play as many cards as the rules say (even if it will hurt them) and comply with all other rules (hand limit, keeper limit, etc.). Once they have done so, play continues to the next player clockwise. Turns continue in the exact same way (except for the constantly changing rules on how many cards are drawn, played, etc.) until a player has fulfilled the requirements of the current goal card (and has no creeper cards in front of them unless one of the required cards is actually a creeper card). The first player to do so, wins Firefly Fluxx. 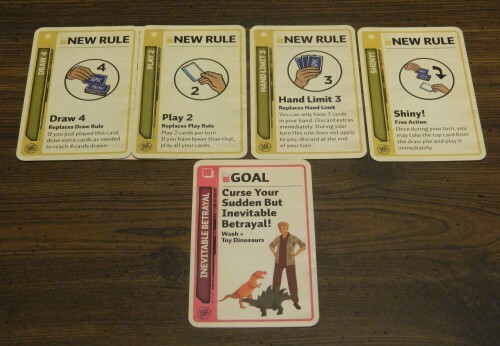 This player has played both the Wash and toy dinosaurs keeper cards to the table and is in a position to win the game. However, they do have a creeper card in front of them that they will have to get rid of. Luckily, they also have the Mal Reynolds keeper card which has a special power that can be used to move a creeper card to another player. Thus, as soon as they use Mal’s power they will win the game. 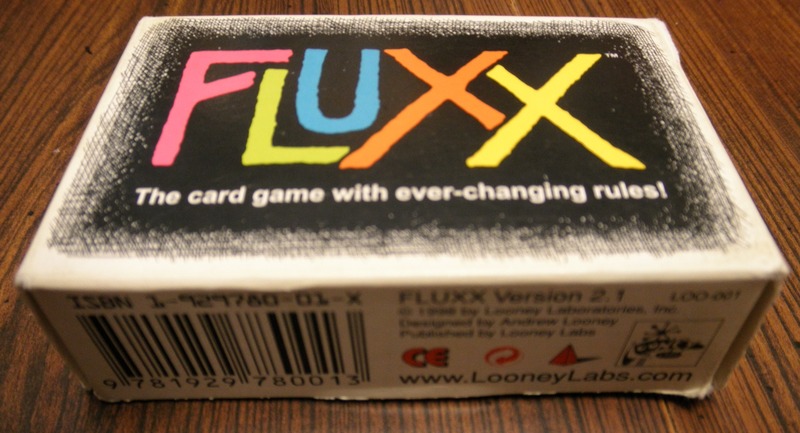 Note: Since Firefly Fluxx is the same basic game as the original Fluxx (but with different cards, special powers, etc.) and we have already reviewed it, this review will focus more on what it adds to the game instead of a review of the core game itself. If you are looking for a review of the core game, check out our Fluxx review for more information. 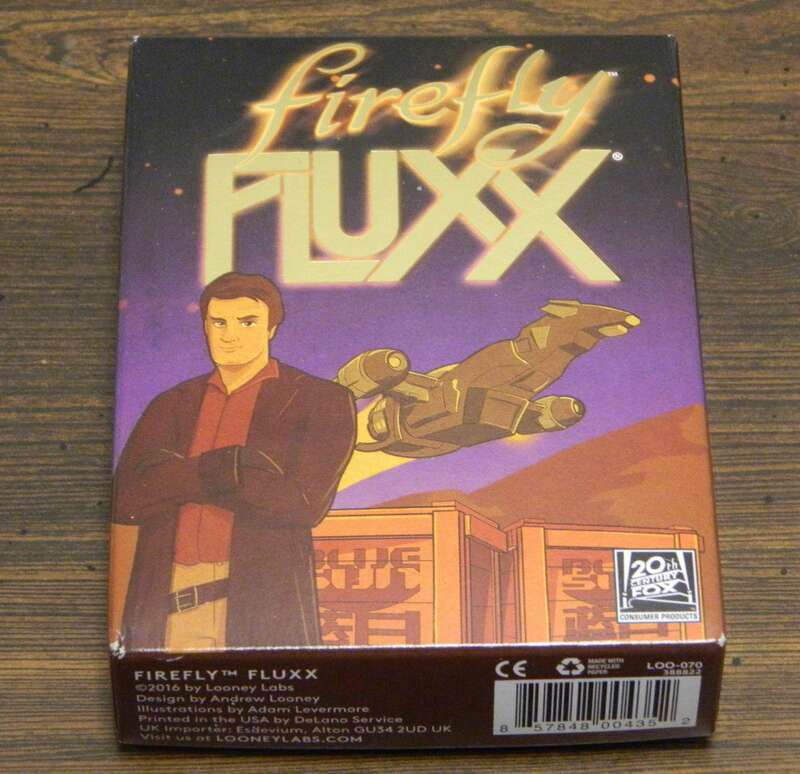 Most of the general positives and negatives of the main game still apply to Firefly Fluxx. Fluxx is one of those games that gamers have a wide range of opinions on. Some people love the series while others think it is too casual and luck-based to be considered a “good” game. Personally, I really like Fluxx even though I know it is high on the luck to strategy ratio (and I generally do prefer more strategy than luck). Also, since I consider myself to be a Browncoat (a Firefly fan for those who don’t know), Firefly Fluxx is pretty much the perfect re-skin for me and other fans of the show. Since Firefly Fluxx is pretty much the same as the core game (other than a few unique cards that change the game a little bit), you pretty much have to like both Firefly and Fluxx to even be interested in this game. If you hate Fluxx or just somewhat like the game but either don’t like Firefly or already have a copy of one of the other sets, Firefly Fluxx is definitely not essential to purchase. This game is obviously intended for those who like both Fluxx and Firefly and I think most fans of both should enjoy it, even though it is pretty much the same as the core set just with a new theme and a few unique cards. A few examples of the art style in Firefly Fluxx. Since the theme is the most important thing for a game like this, I’ll start by talking about the art style. While I know the cartoony (almost anime-like) style Looney Labs went with won’t appeal to everyone, I actually really love it. In fact, if there was ever a Firefly animated series (which would be amazing and absolutely needs to happen sometime), I would like it to be made in this type of style. That’s how much I love it. 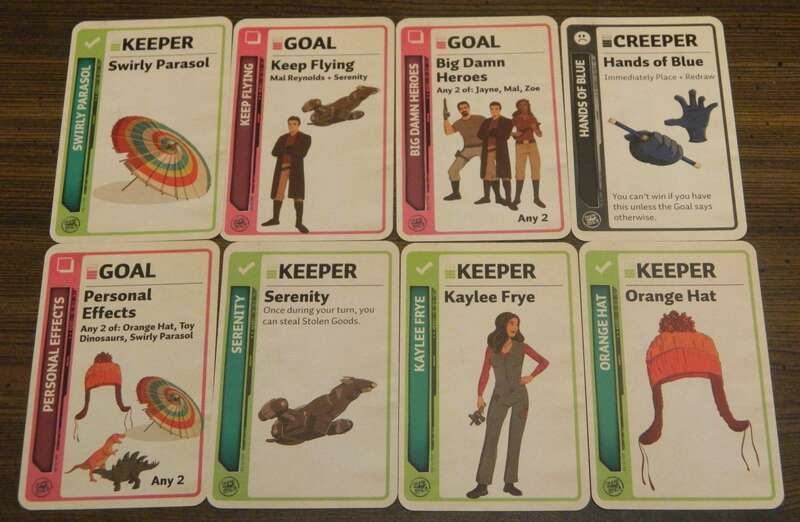 However (while this is the same for all Fluxx games that I have seen), the only cards that actually have art on them are the goal, keeper, and creeper cards (new rule cards have some basic, non-Firefly related art as well). The other types of cards don’t really need art (since they are more text-heavy cards) but it could have helped add to the theming a bit. Also, the art on the keeper cards are also basically re-used for the goal cards (though this does make it simpler to know which keeper cards to look for). Even though there isn’t a ton of new art in Firefly Fluxx, I do really like the style and think it is a big positive for the game. As usual for Fluxx, the cards are all themed pretty well with all of the major Firefly items, characters, quotes, etc. represented. However, since the show only lasted fourteen episodes (only eleven of which actually aired on FOX) the game did have to reach a little bit for a few of their cards. While I remember things like Wash’s “Curse your sudden but inevitable betrayal!” quote and Jayne’s hat, there are a few things that I completely drew a blank on. It’s been a few years since I watched the show or movie but I really don’t remember “hands of blue,” the “Lassiter gun,” or who “Niska” is (so not quite all of the references are completely memorable). However, there are surprisingly few cards that have obscure references on them for a show that only lasted about half a season. Since I only own and have played Fluxx (the 2.1 version) and Zombie Fluxx, I can’t be 100% sure of which cards in Firefly Fluxx are completely unique or add something new to the game. However, Firefly Fluxx does seem like it has some interesting and unique cards in its 100-card roster. One of the most interesting cards is “I’ll Be in My Bunk” which hilariously forces the player who plays it to leave the room for a few minutes and have their turn(s) be skipped (though nobody can mess with their stuff and they do remain eligible for victory). While this card will probably usually be bad for the player who plays it, there are some circumstances where it could actually help them win. For example, if you have the play all new rule card, you could play that and then this card to force all other players to play all their cards and possibly force them to give you the win while you are relaxing for a few minutes. I’m not sure if there are other Fluxx games that are similar but there seems to be a lot of chances to steal in this version of the game (which makes a lot of sense since the show is about a group of space pirates). Fluxx usually has a pretty decent supply of “take that” type cards but it seems like Firefly Fluxx has even more than usual. 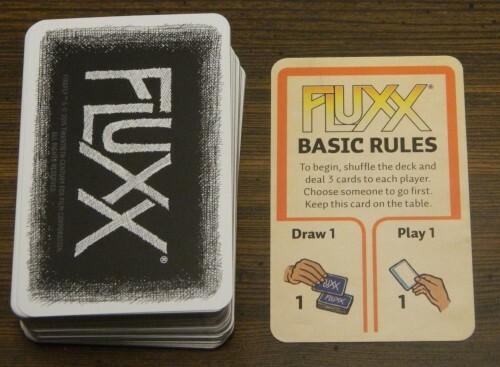 If you like messing with your friends, this might be the version of Fluxx to buy. Otherwise, Firefly Fluxx is pretty much the same as the main game. It pretty much has the exact same pros (the game offers a lot of different strategies and is constantly changing, it is relatively easy and quick to play, etc.) and cons (very luck heavy especially when it comes to card drawing) of the core set so I won’t go any more in-depth in reviewing the gameplay (you can check out our review of the base game for more information on that). Since I am a Browncoat, it isn’t too surprising that I liked the theme of Firefly Fluxx and will probably play this version the most out of all my Fluxx games. The art style is very nice, the references are good, and there does appear to be a few unique cards with interesting new mechanics. If you love Fluxx and/or Firefly or are interested in playing Fluxx with multiple decks at the same time (there are game variants out there that will allow you to do so), I do think Firefly Fluxx is worth the price. For Firefly fans who have no experience with Fluxx, I highly recommend you read the how to play section of this review (if you haven’t already) as well as Eric’s review of the base game to make sure that the concept of the game interests you. If it does, I think you will love the game. 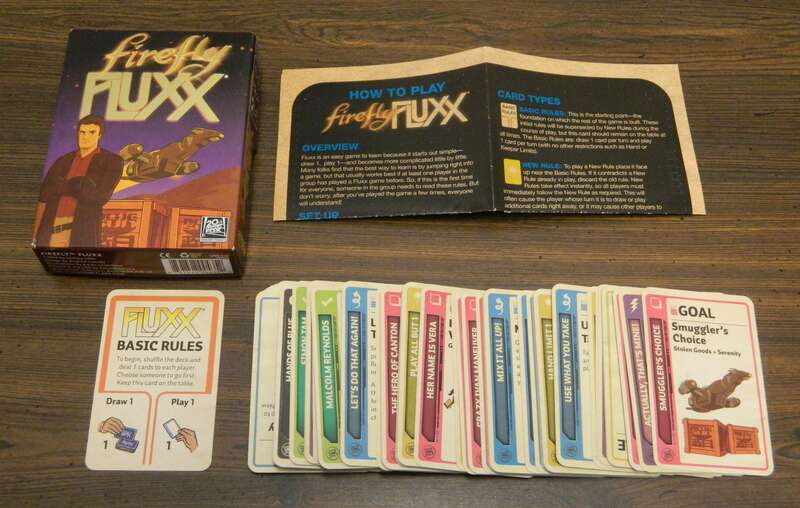 However, if you hate Fluxx, just somewhat like it and already own a copy, or don’t care for Firefly, Firefly Fluxx probably isn’t worth adding to your collection. A Browncoat who can’t remember Niska (the old guy from Train Job and War Stories) who ‘killed’ Mal? The Lassiter is the laser gun that Mal’s ‘wife’ Saffron/Bridget/Yolander steals from her ex-hiusband who lives on his own private floating island (episode is called Trash), and finally Hands of Blue who are the creepy guys who are searching for River Tam and use some sort of sonic gun to kill people in the episode Ariel which is set in the hospital, where Jayne betrays the Tams. Firefly is unquestionably the finest space cowboy series to be cancelled after 11 episodes! For the record I DO consider myself a firefly fan (as if you hadn’t guessed) and I’ve met Sean Mayer, Mark Shepard and Nathan Fillion at comic cons. Theming is pretty good especially for a franchise that only got 14 episodes and a movie. Not essential for non-Firefly fans.